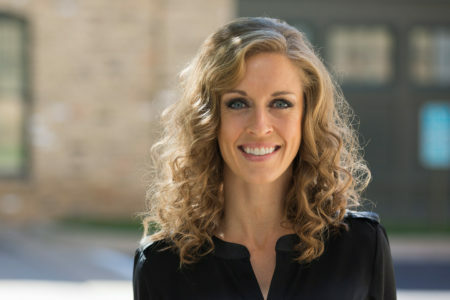 Gina Blayney, President and CEO of Junior Achievement of The Upper Midwest describes it as a revitalization of both a building and experiential learning. 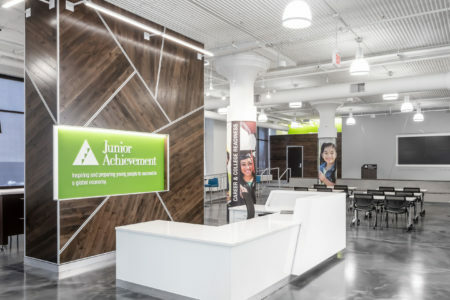 The opportunity presented by Junior Achievement’s move to a new headquarters, one embedded in an urban neighborhood, is expanding offerings and impact. The new headquarters and learning lab is located in a 100+ year building along the light rail in St. Paul. The location makes JA more accessible, visible and relevant. It’s also created space for new programs and more students. For our design team, the project also represented an opportunity to breathe new life into a 1916 brownstone. Originally a print shop, the 50,000SF building was considered inventive for emphasizing daylight and ventilation. The reinforced concrete structure and tapestry brick provided a solid foundation, while structural columns and an encased central staircase were design challenges. For a program more suited to new construction, the decision to restore an existing, historic structure required careful and creative design thinking. Ultimately, the simplicity of the original building shines through. Our team stripped away years of renovations, returning much of the structure to its original patina. The enclosed staircase was opened and re-orientated to provide a level of transparency and connection between floors. Administration offices, training rooms and a high-tech stage with a 150-seat auditorium are on the first floor. The second and third floors are where JA’s most popular programs reside: Biz Town and Finance Park. On each floor, 18 simulation labs, each representing a unique business, will engage students daily. The structural columns provide a natural outline for JA’s City Center, a town square-like space where students gather. Each will be wrapped in custom branded graphics to highlight one of six major career fields outlined by the Minnesota Department of Education. iPads located on ledges, educate and promote exploration. An entirely new program will be offered in the basement. 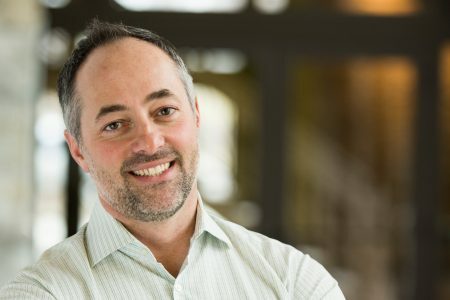 Innovation Incubator is designed specifically for young entrepreneurs with businesses to develop, launch and accelerate. 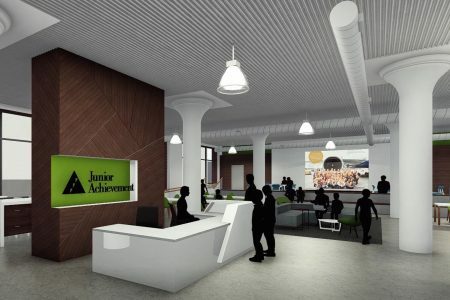 Opening in early 2019, Junior Achievement’s bright, vibrant new home will help thousands of students discover the self-efficacy they need to drive future success.